US Marines who served in the 3rd Platoon, Company A, 1st Battalion, 1st Marines, 1st Marine Division, along side Marine Sgt. Alfredo "Freddy" Gonzalez recite the Pledge of Allegiance as students, teachers, and fellow Marines commemorate the 50th anniversary of Marine Sgt. Alfredo "Freddy" Gonzalez' death during the Vietnam War at Freddy Gonzalez Elementary on Friday, Feb. 2, 2018, in Edinburg. Gonzalez died during the battle of Hue defending the lives of his fellow Marines on Feb. 4, 1968 at age 21 in Vietnam, for which he posthumously received the Congressional Medal of Honor. 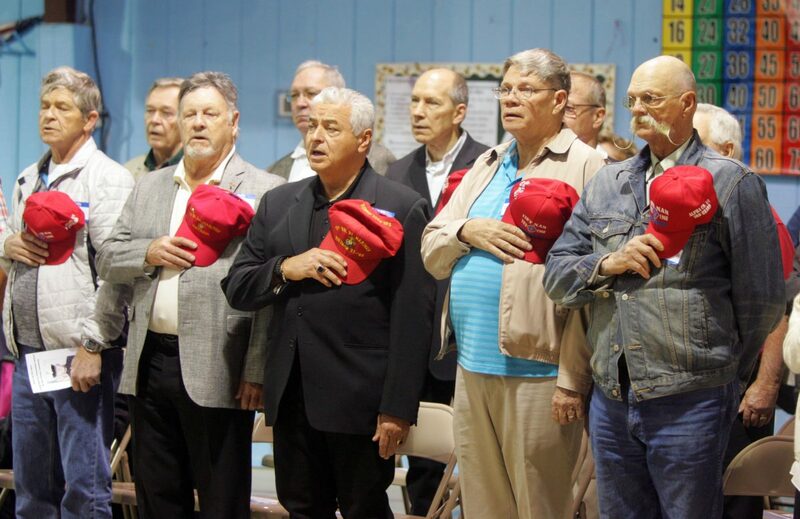 EDINBURG — About a dozen Vietnam veterans from across the country traveled to South Texas this week to pay tribute to their fearless leader, Sgt. Alfredo “Freddy” Gonzalez. Sunday marks the 50th anniversary of his untimely death. Members of the 3rd Platoon, Alpha Company, 1st Battalion, 1st Marine Regiment traveled thousands of miles to attend a ceremony in his honor at Freddy Gonzalez Elementary School Friday morning. Dolia Gonzalez, mother of Alfredo "Freddy" Gonzalez talks with student Clarissa Valadez, who recited a poem in honor of her son, after a ceremony commemorating the 50th anniversary of U.S. Marine Sgt. Alfredo "Freddy" Gonzalez' death during the Vietnam War at Freddy Gonzalez Elementary on Friday, Feb. 2, 2018, in Edinburg. Gonzalez died during the battle of Hue defending the lives of his fellow Marines on Feb. 4, 1968 at age 21 in Vietnam, for which he posthumously received the Congressional Medal of Honor. A wreath is placed next to a photo of US Marine Sgt. 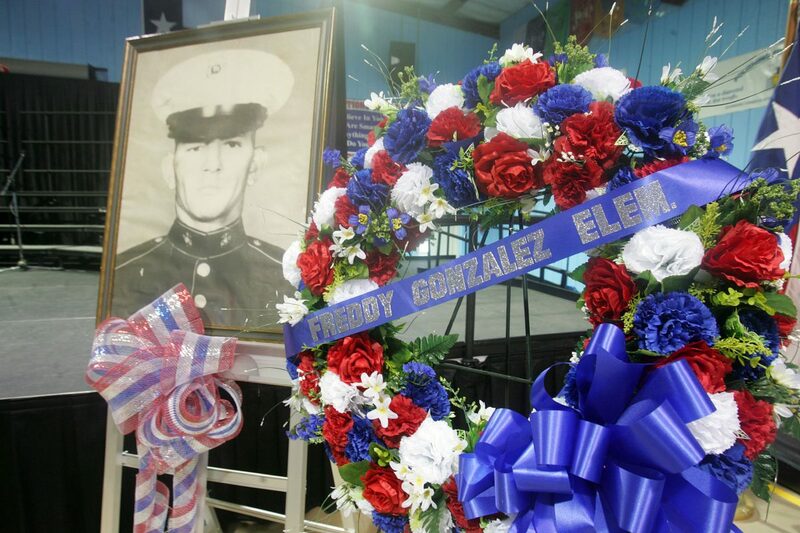 Alfredo "Freddy" Gonzalez as students, teachers, and fellow Marines commemorate the 50th anniversary of Alfredo "Freddy" Gonzalez' death during the Vietnam War at Freddy Gonzalez Elementary on Friday, Feb. 2, 2018, in Edinburg. Gonzalez died during the battle of Hue defending the lives of his fellow Marines on Feb. 4, 1968 at age 21 in Vietnam, for which he posthumously received the Congressional Medal of Honor. 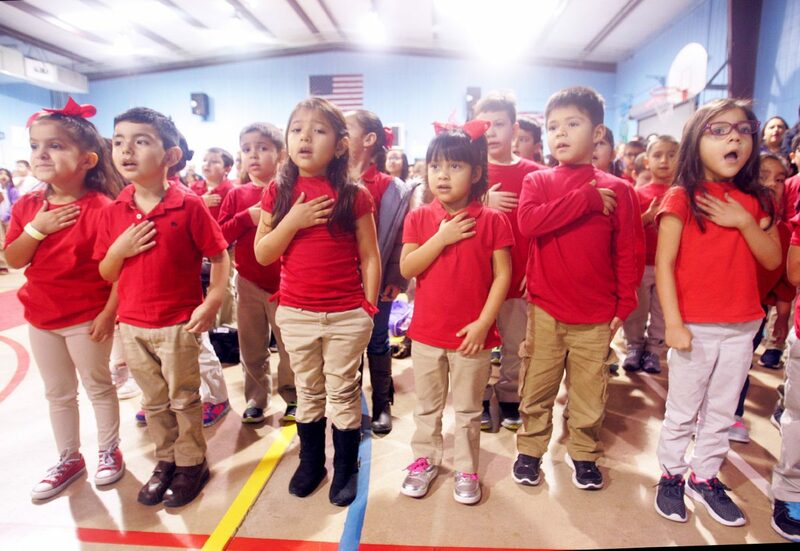 Students from Freddy Gonzalez Elementary hold their hands to their hearts while reciting the Pledge of Allegiance as students, teachers, and fellow U.S. Marines commemorate the 50th anniversary of Marine Sgt. Alfredo "Freddy" Gonzalez' death during the Vietnam War at Freddy Gonzalez Elementary on Friday, Feb. 2, 2018, in Edinburg. Gonzalez died during the battle of Hue defending the lives of his fellow Marines on Feb. 4, 1968 at age 21 in Vietnam, for which he posthumously received the Congressional Medal of Honor. 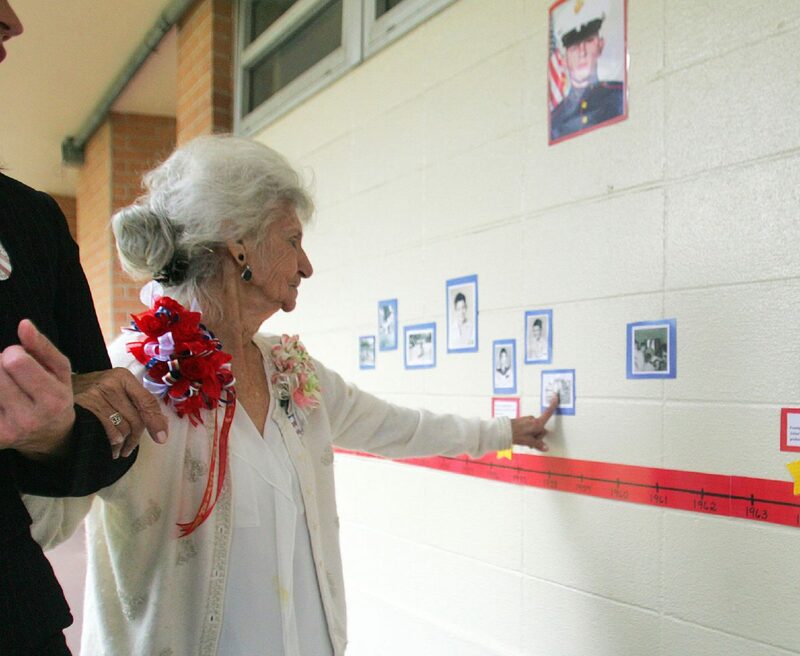 Dolia Gonzalez, mother of Alfredo "Freddy" Gonzalez, touches a picture of her son as a young student while she walks the hallways of Freddy Gonzalez Elementary after a ceremony commemorating the 50th anniversary of U.S. Marine Sgt. Alfredo "Freddy" Gonzalez' death during the Vietnam War at Freddy Gonzalez Elementary on Friday, Feb. 2, 2018, in Edinburg. Gonzalez died during the battle of Hue defending the lives of his fellow Marines on Feb. 4, 1968 at age 21 in Vietnam, for which he posthumously received the Congressional Medal of Honor. 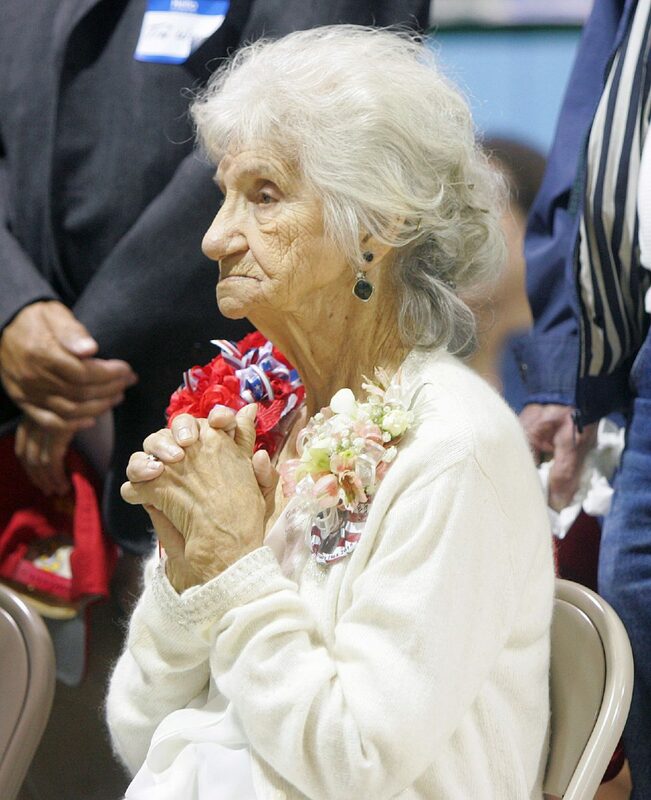 Dolia Gonzalez, mother of Alfredo "Freddy" Gonzalez listens as poems are read and songs are sung in honor of her son, as students, teachers, and fellow US Marines commemorate the 50th anniversary of Marine Sgt. Alfredo "Freddy" Gonzalez' death during the Vietnam War at Freddy Gonzalez Elementary on Friday, Feb. 2, 2018, in Edinburg. Gonzalez died during the battle of Hue defending the lives of his fellow Marines on Feb. 4, 1968 at age 21 in Vietnam, for which he posthumously received the Congressional Medal of Honor. 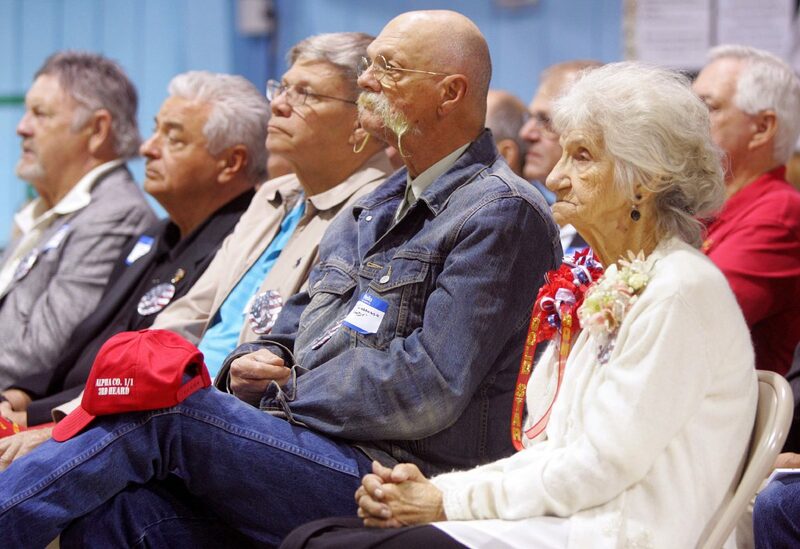 Dolia Gonzalez, mother of Alfredo "Freddy" Gonzalez sits next to Gary "Woody" Giarruso, and other fellow U.S. Marines who served in the 3rd Platoon, Company A, 1st Battalion, 1st Marines, 1st Marine Division, as students, teachers, and fellow U.S. Marines commemorate the 50th anniversary of Marine Sgt. Alfredo "Freddy" Gonzalez' death during the Vietnam War at Freddy Gonzalez Elementary on Friday, Feb. 2, 2018, in Edinburg. Gonzalez died during the battle of Hue defending the lives of his fellow Marines on Feb. 4, 1968 at age 21 in Vietnam, for which he posthumously received the Congressional Medal of Honor. Gonzalez, a decorated war hero and beloved son of Edinburg, died 50 years ago protecting his men at the Battle of Hue City, where he selflessly led the charge against enemy lines. “When he made a decision, he stuck to it,” Vietnam veteran Jack Rushing of Nacogdoches, Texas, said. The tight-knit group of men, who meet every other year for a larger battalion reunion, shared their fondest memories of their brother in arms. Gene Wright, of Arizona, remembers the reaction Gonzalez had to news of a casualty caused by friendly fire. A vast majority of them were very young at the time. Terry Strassburg fought hard to suppress tears when describing Gonzalez. Nearby, a few others clutched tissue boxes. Their deeply rooted respect for Gonzalez also extends to his mother, Dolia Gonzalez, who was also present at Friday’s event. “She deserves all the credit for raising a young gentleman that grew up to be a great person,” Wong added. 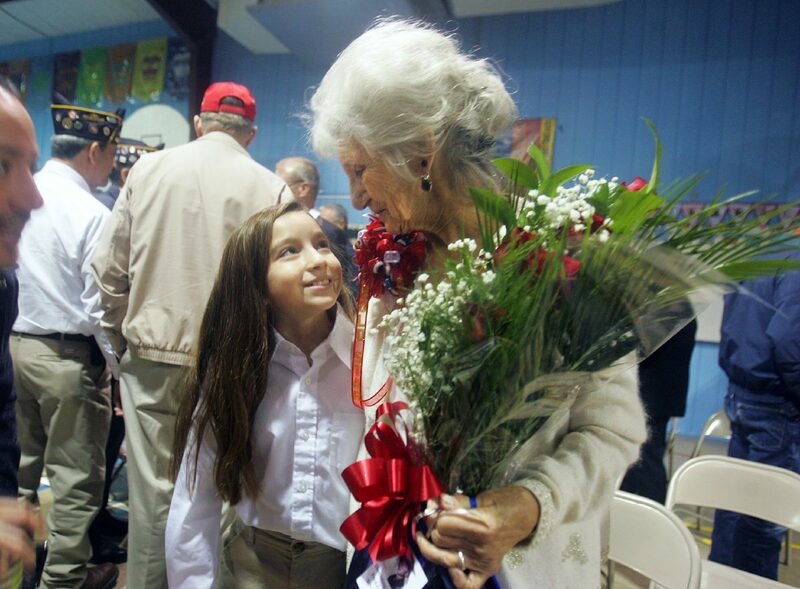 Most of the men were pleasantly surprised at all the honors that have been bestowed on Gonzalez, including the naming of a roadway, a park and a school. “I’m so proud of Edinburg for doing what they’ve done,” Rushing said.